This is a close relation to the stuffed pancakes I blogged way back in February, and although it doesn't look it, it is a less heavy option. I suspect this is in part due to the size of the cannelloni! I made these a few weeks back, when summer looked like it was gone for good, hence the rather wintery meal. These are great if you want to make something ahead of having a laid back supper with guests as they can be made the night before. Serve with green beans or salad for a splash of colour and freshness. It does look all rather beige otherwise. If you're planning to eat the cannelloni immediately, preheat the oven to 190°C. Otherwise, begin by preparing the bechamel sauce: melt the butter in a pan over a low heat, then when molten, stir in the flour. Cook for a minute before adding the milk bit by bit, stirring constantly. Stir in a teaspoon of mustard and then season to taste with salt and pepper. Next, finely chop the onion and gently fry over a low heat until translucent. While the onion is frying, chop the mushrooms and cut the chicken breast into small dice. Fry the mushrooms with the onions for a couple of minutes, until soft, then add the chicken and spinach. Add a couple of tablespoons of the bechamel sauce and mix together. Allow to cool for about 10 minutes. Chop the mozzarella into small dice and stir into the chicken and mushroom sauce. Spoon a further 2-3 tablespoons of the bechamel sauce into the bottom of a large ovenproof dish (I used a 20x30cm roasting tin) and make sure it covers the bottom. Next, spoon the chicken, mushroom & mozzarella mixture into each of the cannelloni until they are full then place in the ovenproof dish. Repeat until all the cannelloni are stuffed. If you have any excess stuffing, just spoon this over the top of the cannelloni. 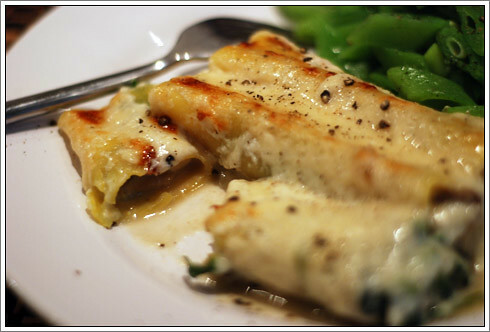 Pour the remaining bechamel sauce over the cannelloni, then grate the parmesan and sprinkle on top. Cover with tin foil and bake for 35 minutes. After 30 minutes, remove the foil and bake for a further 10 minutes, until the grated parmesan turns golden. Mmm all your recipes sound delicious, but I definitely have to make this one! Will swap out the chicken for Quorn and devour for dinner tonight I think! thank you! if you want to make it veggie, i'd just double the mushrooms; though quorn would work just as well!